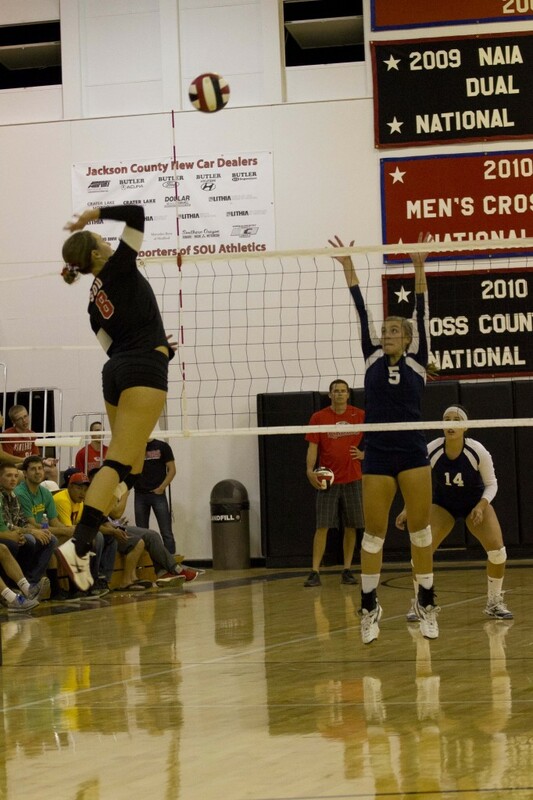 Natalie Scheller goes up for a spike against Corban. The Southern Oregon volleyball team picked up its 19th consecutive win against Corban, defeating the Warriors 3-1 (22-25, 25-23, 25-20, 25-15) Saturday night at Bob Riehm Arena. 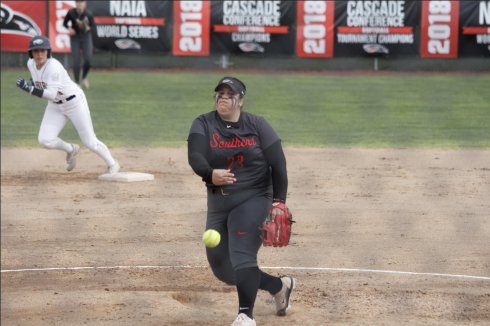 Southern Oregon improves to 12-7 overall and 8-1 in conference play, while Corban falls to 3-12 overall and 1-8 in the CCC. The Raiders remain at home next weekend to host Concordia on Friday and Warner Pacific on Saturday, with match time set at 7 p.m. for both nights. Natalie Scheller finished with a match-high 16 kills for the Raiders, while Jordan Crossley added 14 and Haley Kasler tallied 11. Renee Yomtob posted 25digs and Angela Spieker led the team with 31 assists. Haley Kasler catches some air time. For Corban, Chandra Teague tallied a team-high 14 kills, while Claire Bailey added 12. Katherine Salness finished with 33 assists and Kiersten Hilt totaled 15 digs in the loss. Southern Oregon opened the first set on a 7-0 run, but Corban responded with a 15-8 stretch to tie it up at 15-15. The two teams remained close the rest of the way, as the set featured four tie scores. Corban grabbed its first and final lead of the set when the Warriors used a five-point streak to turn a 21-19 deficit into a 24-21 advantage. Following a Corban service error, Teague closed out the set with a kill for the Warriors. 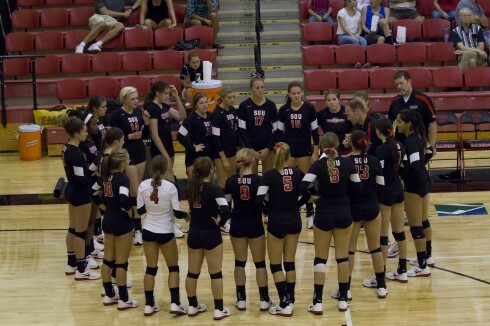 The second set included eight tie scores and three lead changes, as neither team led by more than three points. This time Corban held a late two-point advantage at 21-19, and the Raiders closed strong to win the set. Southern Oregon finished the set on a 6-2 run, scoring the final four points and sealing the set victory on a kill by Sam Boehnke. 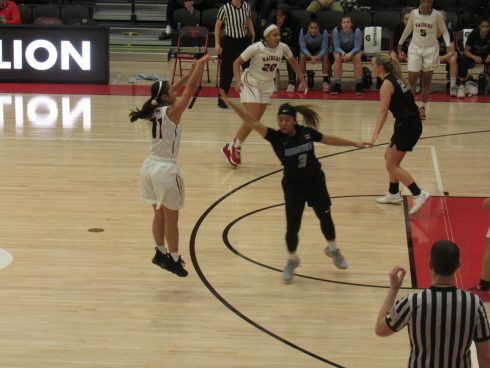 Southern Oregon used a 12-2 run midway through the third set to claim a 10-point lead before Corban methodically worked its way back into the contest. The Warriors pulled within three at 21-18 on a block by Claire Bailey and Courtney Mulford, but SOU scored the next two points and clinched the 25-20 set win on a kill by Nikki Keller. The fourth set again saw SOU use a big run to pull ahead, and this time the Raiders continued to pull away. 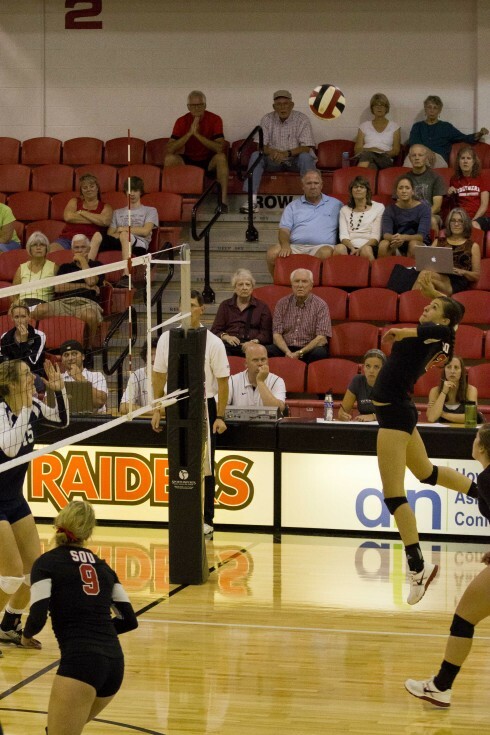 Back-to-back kills by Kasler and Scheller started a 12-1 SOU stretch that put the Raiders up 17-7. Following five straight Corban points, the Raiders closed out the set on an 8-3 run and closed out the match victory on a Crossley’s 14th kill of the night. Coach Josh Rohlfing speak the team. The Raiders hit .186 as a team, while Corban hit .137 for the match. The Warriors finished with 11 blocks, while SOU tallied eight.